Crispin Akerman continues to master simplicity and balance within his favoured genre, the still life. He uses a timeless vocabulary of domestic items such as fruit, flowers, ceramics, bowls and pitchers presented against the textural folds of table linen and drapery. Crispin uses props which are readily at hand and while they are largely observational, he explains, “the subjects allow for the exploration of harmony, balance/tension, light and atmosphere. In still life these everyday items become great subjects for the study of objects in space. These paintings explore their intimate nature in a non-specific location”. Still life did not emerge as a subject in its own right until the early 17th century, where it had its greatest currency in Flanders and Holland. Often collections of objects were arranged to display a painter’s virtuosity or put together in association with each other to have a significance beyond their individual appearance. Crispin references both Dutch seventeenth century painting as well as a brand of modern hyper-realism, setting up a tension and dynamic not often associated with the austerity of still life painting. This is Crispin’s seventh solo exhibition at Beaver Galleries. Born in England, Crispin Akerman came to Australia with his family in 1966. He spent many years in the music industry but left that in 1989 to pursue his lifelong interest in the visual arts. 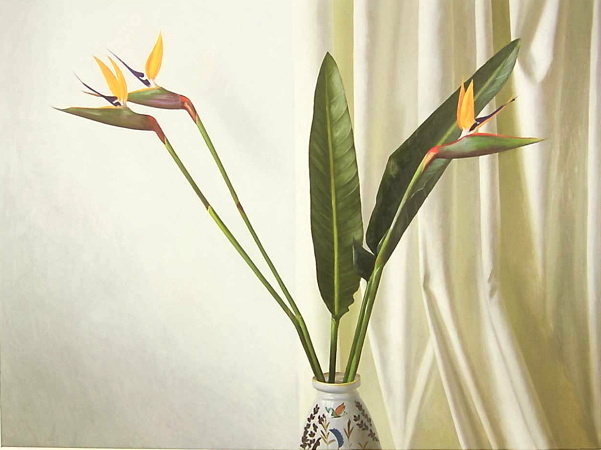 He received a Bachelor of Visual Arts from the Canberra School of Art in 1992 and, since then, has focused on his art practice, achieving significant recognition. Crispin’s first ever solo show was held at Beaver Galleries in 1995 and his popularity has gone from strength to strength with each exhibition. Crispin’s work is represented in the collections of Artbank, Parliament House, BHP Billiton and the Australian National University.